I didn’t get a chance to tell you about these delightful treats when I made them a few months ago, so I’m taking the opportunity now. It’s another recipe I enjoyed from A Modern Way to Cook: 150+ Vegetarian Recipes for Quick, Flavor-Packed Meals by Anna Jones. It’s one of those not-too-decadent sweets that you taste and don’t realize anything is missing until you’re told. There’s no refined sugar in the bars and no flour or grains of any kind, and they can be made vegan. As a bonus, they’re easy to make too. You just have to wait briefly for the bars to chill at a couple of points, and then wait for the chocolate to set after dipping. Then, you’ll have something like a much better version of an Almond Joy made with the ingredients you choose. 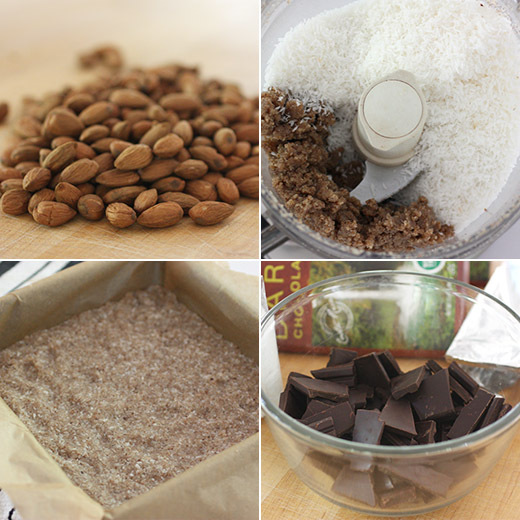 The first step is to grind seven ounces of whole almonds in a food processor until they become almond butter. Next, three tablespoons of honey or agave syrup or maple syrup is added with two tablespoons of melted coconut oil, the seeds from a vanilla pod, and a pinch of salt. The mixture is processed to combine. Five ounces of unsweetened, shredded coconut is added next, and you should pulse a few times to form a dough of sorts. The dough needs to be patted into a parchment-lined eight-inch square pan, and the pan then needs to be placed in the freezer for a few minutes for the dough to set. Meanwhile, seven ounces of dark chocolate should be broken into a heat-proof bowl to use as a double-boiler. Melt the chocolate over a saucepan with simmering water and set aside. The chilled dough is then removed from the pan and cut into whatever shapes you prefer for the bars. After cutting, place them on a baking sheet and chill again before dipping. 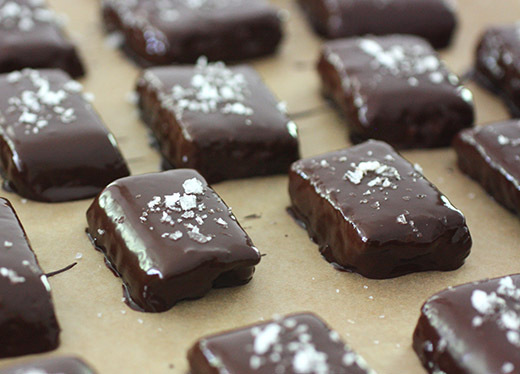 Once the melted chocolate has cooled slightly and thickened, dip the cut and chilled bars and place them on a parchment-lined baking sheet to set. 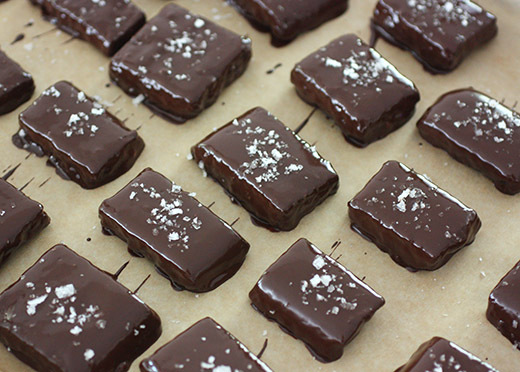 Sprinkle with flaky sea sat after dipping in chocolate. Place the baking sheet in the refrigerator for the chocolate to set, and then store refrigerated. I found the mix of chocolate, coconut, almonds, and a bit of flaky sea salt impossible to resist. And, since they’re the kind of treat you don’t need to feel too guilty about, I predict there will be frequent appearances of them in my kitchen. There’s a similar recipe in the book that I need to try next called Raw Cookie Dough Bars, and that one is made with Brazil nuts pulverized in a food processor. And really, every single page of this book has something I want to try. Do you have an opinion of British food? Has your opinion changed in recent years? Lately, British cuisine seems to be surging forward with England, Scotland, and Wales receiving 181 Michelin stars in 2015 and several restaurants and chefs gaining popularity internationally. In Colman Andrews latest book, The British Table: A New Look at the Traditional Cooking of England, Scotland, and Wales of which I received a review copy, he examines the changes in British food and its perception over the centuries. He writes: “The mystery isn’t so much why British food is so good today, but why it ever wasn’t.” The coastline, the soils, the microclimates have always been there for producing great ingredients, and the region was known for superior meals until sometime in the 19th century. Heston Blumenthal is quoted for suggesting that the Victorian “abstemious moral code” had something to do with people turning away from the pleasures of dining well. Later, French cuisine became more fashionable than traditional, British fare. A food revival began in the mid-20th century with influence from immigrants at the same time as a new look at heritage foods was starting. The book covers traditional foods and more current inventions from across Great Britain. It’s an interesting combination of history and current events in the British food scene, and it’s full of beautiful photos by Christopher Hirsheimer and Melissa Hamilton. Among the lovely soups, there’s Cullen Skink which is a smoked fish soup, and now I need to get my hands on some finnan haddie to make it. In the Fish and Shellfish chapter, Poached Salmon Steaks with Whisky Sauce and Fillet of Cod with Parsley Sauce both caught my eye. There are poultry and meat dishes in addition to wild game and offal. It was interesting to learn that “Game Chips” that are served with Roast Grouse are what the British usually call “crisps,” but regardless of the name, they look delicious. Expected names like Yorkshire Pudding and Cornish Pasties appear in the Savory Pies chapter, but I was surprised to find Vegetarian Haggis among the vegetable dishes. It’s made with lentils and has been served at The Ubiquitous Chip in Glasgow since the 1970s. The book also includes snacks, sweet, and a chapter for Whisky, Cider, Beer, and Wine. I wanted to try something vegetarian and was very curious about that version of haggis but decided on Glamorgan Sausages instead. Obviously, there is no sausage in vegetarian Glamorgan sausages. The name of these Welsh croquettes came about because of their sausage-like shape and the use of cheese made from the milk of Glamorgan cows. The recipe calls for Caerphilly or another Welsh cheddar, but the best I could do was to find Montgomery Cheddar from Neals Yard Dairy. First, finely chopped leek and scallion were sauteed in butter, and since it is kale season, I had to add some chopped kale. I seem to add it to everything when I can. Next, the cooled leek and scallion mixture was combined with bread crumbs, grated cheese, thyme, parsley, and dry mustard. It was seasoned with salt and pepper, and egg yolks were added and mixed to combine. Rather than chilling the mixture at this point, I shaped the croquettes and chilled them before proceeding with the breading and frying. The mixture was shaped into “sausages” about four inches long. 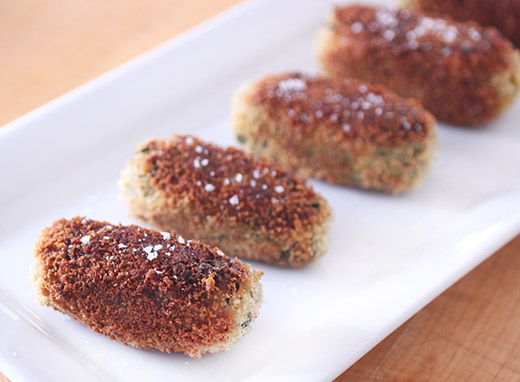 After chilling, each croquette was rolled in flour, dunked in egg whites, and dredged in bread crumbs before being cooked until golden all around. 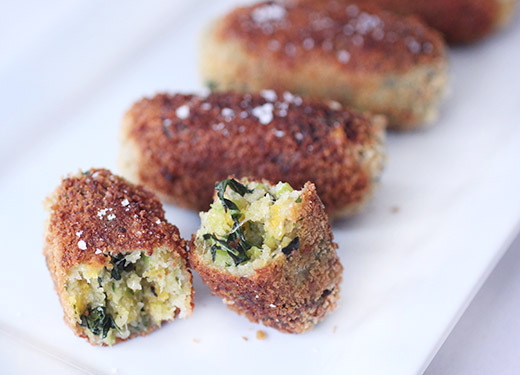 These are hearty and savory, little croquettes. I was surprised at how filling they are and decided they are certainly as substantial as regular sausages. 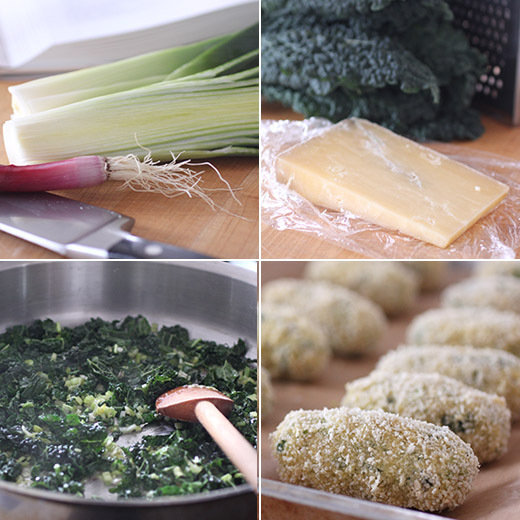 The aromatic leek and scallion give them a lot of flavor along with the rich cheese. I realized this was the first time I had cooked anything Welsh, but it definitely won’t be the last. Recipe reprinted with publisher’s permission from The British Table: A New Look at the Traditional Cooking of England, Scotland, and Wales . The earliest reference anyone has been able to find to these Welsh vegetable croquettes is apparently a line by the nineteenth-century English author, translator, and traveler George Borrow in his book Wild Wales: Its People, Language and Scenery, vintage 1862. After spending the night at a raucous inn at “Gutter Vawr” (the Welsh mining town formerly called Y Gwter Fawr and since renamed Brynamman), he descends from his room for a morning meal. “The breakfast was delicious,” he reports, “consisting of excellent tea, buttered toast, and Glamorgan sausages, which I really think are not a whit inferior to those of Epping.” Interestingly, he doesn’t mention that they contain no meat (Epping sausages are pork sausages flavored with assorted herbs, often cooked without casings). Glamorgan, in far southern Wales, is one of the thirteen original Welsh counties, and was once a small kingdom of its own. These sausages—which were originally a farm family’s meat substitute—are said to have been named not for the county but for the cheese made from the milk of Glamorgan cattle, an old Welsh breed now almost extinct. Melt the butter in a small skillet over medium heat, then add the leek and scallion. Cook, stirring frequently, for 4 to 5 minutes, or until the vegetables are beginning to soften. Let cool to room temperature. In a large bowl, combine the leek and scallion mixture, about three-quarters of the bread crumbs, the cheese, the thyme, the parsley, and the mustard. Season generously with salt and pepper, then stir in the egg yolks and the milk and mix the ingredients together thoroughly. Cover the bowl with plastic wrap and refrigerate it for about 1 hour. Shape the mixture into 8 to 12 sausage shapes, about 2 inches (5 cm) thick and 4 inches (10 cm) long. Heat the clarified butter in a large skillet over medium heat. Sift the flour onto a plate and spread the remaining bread crumbs out on another plate. Roll each sausage in flour, dip it in the egg whites, then roll it in bread crumbs. Fry the sausages for 8 to 10 minutes, turning them occasionally, until they are golden-brown on all sides. The sausages may be served hot or at room temperature. Who doesn’t love a celebration? The cookbook I want to tell you about today is focused on pure fun. Butter Celebrates! : Delicious Recipes for Special Occasions by Rosie Daykin, of which I received a review copy, has recipes that are perfect for several major holidays and other reasons to celebrate throughout the year. Butter Baked Goods is the author’s bakery in Vancouver, and it has become an important part of lots of customers’ celebrations. She mentions that it’s very important to her to always remember that their baked goods aren’t just cakes or cookies, they are elements of shared memories of important days. It’s a great reminder that all the moments we choose to celebrate become those things we remember most. And, it’s lovely inspiration to whip up something sweet and delicious for the next occasion that comes along. Valentine’s Day is right around the corner, so I got to work on the heart-shaped, sandwich Empire Cookies as soon as I saw them. The Heart-Shaped Raspberry Pop Tarts were a close contender. For Easter, there are orange-flavored Bunny Buns that are shaped with little ears sticking up on each bun and Coconut Marshmallow Bunnies. I want to bake the Lemony Lemon Loaf for my mom for Mother’s Day, and if no friends’ baby showers pop up on my calendar, I’ll find another reason to make Lamingtons. Of course, there are chapters for Halloween, Thanksgiving, Christmas, Hanukkah, and New Year’s as well. But, let’s get back to those Valentine’s cookies. The dough is like sugar cookie dough and is made with butter, confectioners’ sugar, eggs, vanilla, pastry flour, and salt. I used a mix of whole wheat pastry flour and all-purpose flour. Once mixed, the dough needs to be chilled before being rolled out. After chilling, my dough was a little crumbly and seemed like it might not roll out easily. I remembered a tip from Maida Heatter about kneading cookie dough to be sure it’s well-mixed. A quick turn or two of kneading by hand was all that was necessary, and then the dough rolled out nicely. It needs to be rolled somewhat thin so that the cookies won’t be too thick once sandwiched in the end. Heart shapes were cut, and I cut enough for one baking sheet of mini hearts as well. The cookies were baked and cooled before being frosted and filled. No need for piping bags or fancy techniques here. 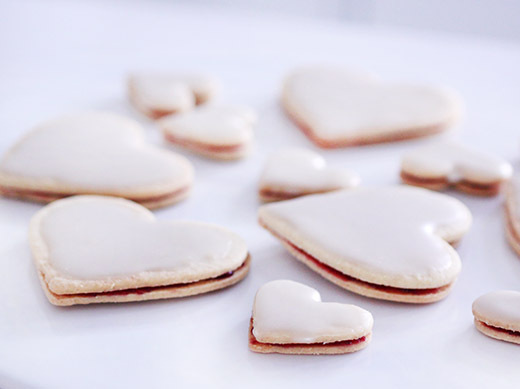 A simple frosting of confectioners’ sugar, water, and almond extract was spread on the top of half the cookies. Next, jam was spread on the bottoms of the remaining cookies. I used locally-made Confituras Cranberry Cinnamon jam for the filling. 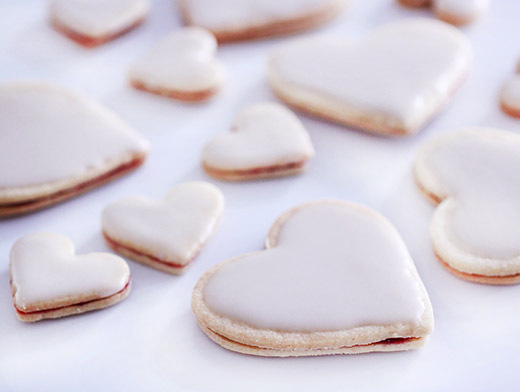 The hearts were sandwiched together and ready to be served. These cookies are especially festive due to the shape and the red jam filling, and they happen to be irresistible once you taste them. They’re a nice mix of tender and crunchy, and aromatic almond extract makes the frosting delightful. Like the rest of the not-too-fussy-or-complicated recipes in this book, this was a treat to make a special day even more memorable. Excerpted from Butter Celebrates! : Delicious Recipes for Special Occasions by Rosie Daykin. Copyright © 2016 by Random House. Excerpted by permission of Alfred A. Knopf, a division of Random House LLC. All rights reserved. No part of this excerpt may be reproduced or reprinted without permission in writing from the publisher. These cookies came about at the bakery after constant daily requests from customers. I am not sure why I resisted for so long given my love for all things raspberry and almond, but when I did eventually answer the cry, I made a lot of people very happy. 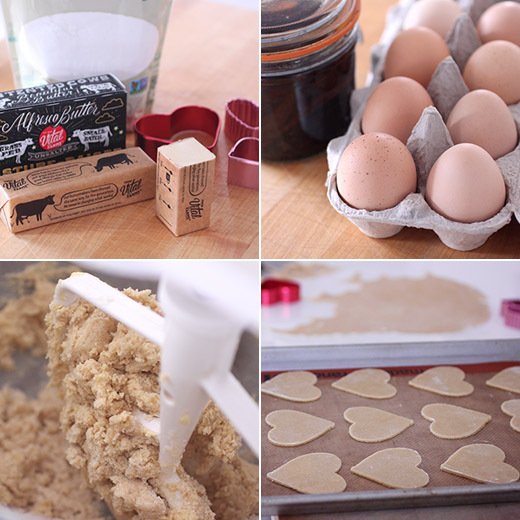 For Valentine’s Day we cut them into pretty scalloped hearts but you can make them year-round using a simple circular cutter. Storage: These cookies will keep in an airtight container for 1 week or in the freezer for up to 3 months. 1. In a stand mixer fitted with a paddle attachment, cream the butter and icing sugar until light and fluffy. Scrape down the sides of the bowl. 2. Add the egg and the egg yolk and beat on medium speed until combined. Scrape down the sides of the bowl and add the vanilla. Beat again. 3. With the mixer running on low speed, slowly add the flour and salt until fully combined. 4. Shape the dough into a large disk and wrap it in plastic wrap. Allow the dough to chill in the refrigerator for at least 1 hour. 6. On a well-floured work surface, roll the dough out with a rolling pin until it is approximately 1⁄8 inch thick. You don’t want the cookies too thick as you will be sandwiching two of them together. Cut shapes with cookie cutters. Very carefully, using a metal spatula, transfer the cookies to the prepared cookie sheets. 7. Bake for 10 to 12 minutes, or until the cookies are a light golden brown around the edges. Remove the cookies from the oven and allow them to cool slightly on the trays before trans- ferring them to wire racks to cool completely. 8. Meanwhile, prepare the icing. In a small bowl, combine the icing sugar, hot water and almond extract. Using a whisk or spoon, stir the icing until it is smooth and glossy. 9. Using a small teaspoon, place approximately 2 teaspoons of raspberry jam on the bottoms of half the cookies. Using the back of the spoon, gently spread the jam almost to the edges of the cookie. 10. Use a small offset spatula to top the other half of the cookies with the almond icing. Don’t press too hard when doing this as they are delicate cookies and you don’t want your tops breaking! 11. Place the iced cookies atop the raspberry-filled bottom and press gently to sandwich them together.